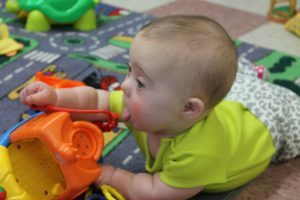 A place for families with infants and young children (0-5yrs) to connect and build friendships within the HNSDSS community. Special Note: Please check the status of the playgroup on facebook before coming. The indoor playground is located in the lower level of a church building. Occasionally the use of the lower level must be cancelled on short notice for church needs. • Indoor footwear only. For children’s safety no sock feet or bare feet are allowed. Adults may wear sock feet. • Parents are required to sign a one-time waiver before children can play in the play room. Directions: Take exit 2 off Hwy -101 into Mid. Sackville/Beaverbank (exit by Wheaton’s). Go straight through the first set of lights. Make a left at the next set of lights onto Sackville Dr. (Kent /Irving at the intersection). Follow Sackville Dr. for ~1.2km. The Halifax Metro Vineyard Christian Fellowship is on the right just before the lights. The entrance to the indoor playground is in the back of the building as well as parking for us.